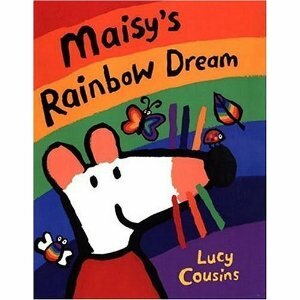 It's a story about how Maisy the mouse falls asleep and has a dream that features all her friends adventuring off to Rainbowland - a magical place filled with walking tea pots, turtles with watermelon shells and several other characters and images reminiscent of "Alice and Wonderland" or what I assume a mushroom trip must be like. It's a strange little book (actually, the book itself is gigantic - maybe part of its appeal for Lily) ... but I digress. As usual. Anyway (spoiler alert) it turns out that all the wacky images in the dream are a compilation of all the things Maisy sees in her waking life. When she wakes up the next morning in her bedroom you see the bee that inspired the bee-panda chimera we read about on the page where "Maisy dreams about a green leaf" and the goldfish that makes Maisy become a Mer-mouse on the page "Maisy dreams about an orange fish." It struck me around the 12th or 13th reading of the book that writing fiction is a lot like dreaming. Not in the sense that writing fiction is something that is unrealistic (although as I've mentioned at this juncture in life it feels unrealistic) but rather that, like Rainbowland, the universe in which your characters live is a compilation of the experiences and observations you have in your actual life. Often, when I see something unusual or unique out and about in the world, I catalog it as something that could potentially be used in a story. The dunk tank I drove by on the highway a couple years ago. The guy buying a shopping-cart full of canned cat food. The people who owned my house years ago and left meticulous not about all the appliances. I get really excited when I come across something that makes me look twice, because I never know when I might be able to put it to use later. It's like when I obsessively collected Peanut M&M wrappers for a time with no real plan and eventually turned them into a lampshade. Lately I've been compulsively gathering acorns in the backyard -- this might be a ploy to get the squirrels to vacate the oak tree so that my dog won't bark at them so much -- but I keep thinking they could end up as some sort of art project for the girls down the road. Maybe I'm just not working on the novel now because I need more acorns.